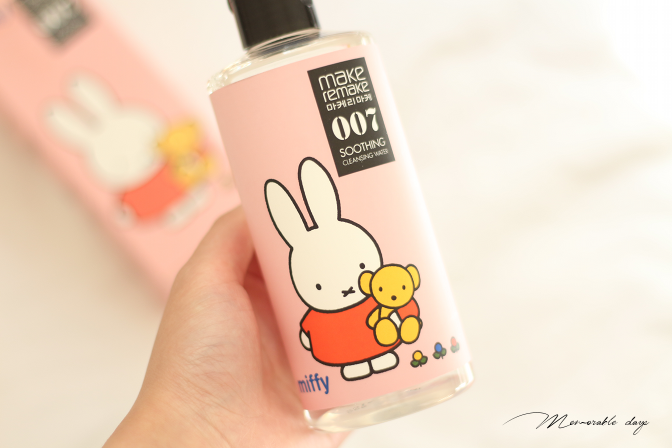 Review: Make Remake Soothing Cleansing Water x Miffy Edition | Memorable Days : Beauty Blog - Korean Beauty, European, American Product Reviews. I am a big big fan of cleansing waters and I am dying to try many of them in the Korean market. I have finished the Son & Park Beauty Water which took me ages to finish. Since a month ago I started using this soothing cleansing water from Make Remake. 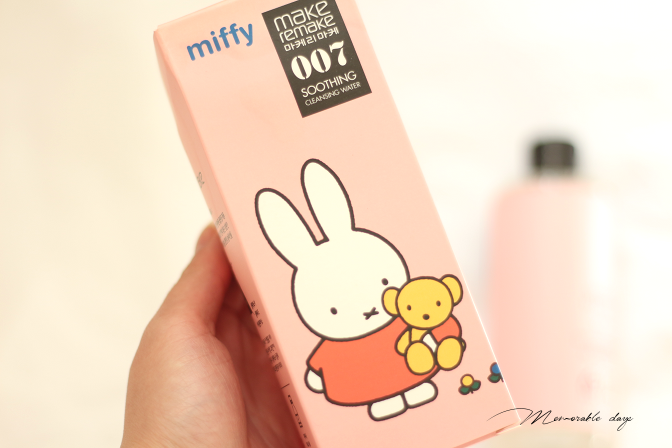 They had a collaboration with Miffy and look how adorable the packaging is O_O! In today's blogpost I will be sharing my thoughts about this cleansing water. Make Remake is a brand from LG Household and Healthcare, the home of The history of whoo, O HUI, Beyond, VDL, Belif, SU:M37 and more. This is a cleansing water that gently removes makeup and moisturizes the skin for a clearer skin. It's soothing and suitable for all skintypes including sensitive skin. It contains 300 ml of product. It comes in a pink packaging with an adorable Miffy on it (Did you know Miffy is Dutch?). It comes in a plastic bottle with a small opening where you can easily poor the cleansing water out. The cleansing water is very runny just like water. The product is translucent and has a sweet peachy scent to it. The scent is light and fades away after application. The scent is not overwhelming but I am not a big fan of it and I do prefer scentless products. I always use this after double cleanse to remove any makeup residue. How to use it? Release an appropriate amount onto a cotton pad and gently wipe the face. You can also clean your eye makeup or lips with this cleansing water, but I always prefer an oil based cleanser to do that, since I use very waterproof makeup. If you don't use that type of make up, you can easily use this cleanser for your eyes or lips, just leave the cotton pad on the area for a minute or two and gently swipe your make up off. It does not need additional rinsing. I received this product from bbcosmetic.com and it's sold for USD $24.21 there. Feel free to use my coupon code LZG213U03 to get discount of 10% on your whole purchase. A thumbs up for the packaging, it's adorable and I like miffy! The cleansing water is extremely soothing on the skin and very gentle as well, definitely suitable for sensitive skintypes. I'm happy that it's 7-free (see ingredients). I use this after I double cleanse and it feels moist on the skin and cleanses the residue of my make up well. Sometimes I can feel that it contains alcohol in cleansing waters, but I cannot feel it in this one because it doesn't feel tight on the skin and it doesn't smell like alcohol as well. Though it's hard for me to see if there is or not, because the full ingredient list isn't available anywhere. The cleansing water has a Ph 6-6.5, which is alright. This cleansing water is perfect for removing make up residue. I wouldn't use it for removing full face make up, since you will need a lot of cotton pads for it and it might take a while, especially if it's heavy waterproof make up like mine lol. So always double cleanse first! Unfortunately, I am not a big fan of the peach scent that it has, but that's a personal preference. 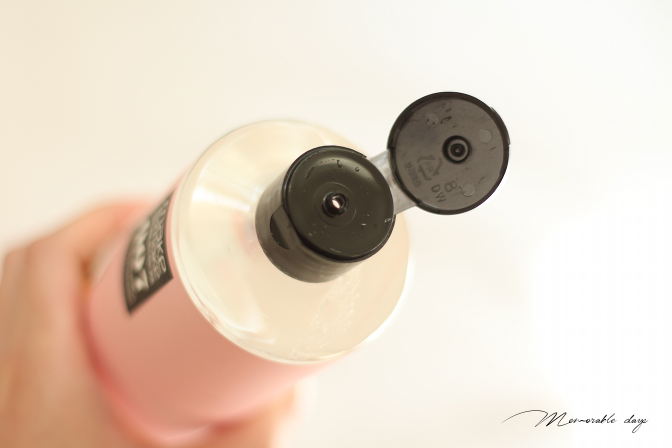 If you are a fan of peach scented products, you will love this!